This was my third stay at Mapaches. It's the best! I can't recommend it enough. The location is beautiful and so well kept. Chelo is the sweetest and her breakfast is the best in the city. Worth every penny. Will return again soon. This is a great, rustic spot for a seasoned traveler that wants some personal time. Chelo and her son provide a wonderful space with clean, cozy cabins, clean bathrooms, hot showers, a gorgeous garden with hammocks and a real breakfast. Also a Complimentary bicycle and map, she gives great guide advice. The location is a quick bike ride into town, and you are very close to the Ruins and beach if you want to beat the crowds in the morning! 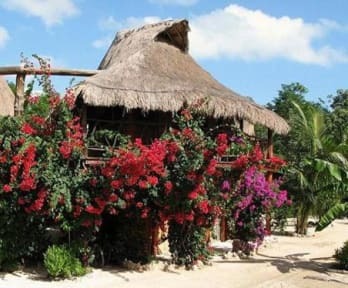 Great hidden gem & price value for very expensive Tulum! The Posada is great! Chelo and his son are kind and welcoming, and the breakfast is amazing. Also, the bike rental included with the room pretty much solves all the transportation problems to visit either the beach or the town. Amazing hostel, great host, great breakfast, comfortable rooms, an absolute gem. Close to the beach and the ruins, a bit of a distance from the center of town.
. 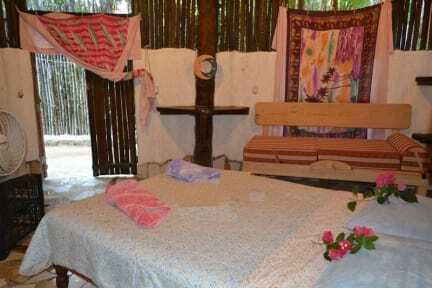 Staying at Chelo's Posada los Mapaches was perfect for my trip. Being treated like a guest, with a beautiful well kept facility. A bike of your own and a first class hot breakfast every day. It was comfortable and just a bike ride from all Tulum has to offer. You won't find better people, beds, or food. Stayed in 10 places on my 5 wk trip and this was the best. Highly recommend Posada los Mapaches. Lovely facility. Breakfasts are big. They treat you like family there. I really felt welcomed and cared for. Absolutely loved my stay at Los mapachos...Chelo and Joachin wonderful hosts and were available for any questions or concerns. Breakfast daily was delicious and met people from all over the world! Nice touch to have bike included with only 5 minute bike path ride to beach! Enjoy your stay in their cizy and comfortable rooms, complete with hammocks! Staying here was a very interesting experience! The lady who runs the place is rather abrasive but well meaning...spraying all our stuff with bed bug spray and taking our passports as a deposit upon arrival. Also no check in after 9pm as she goes to bed! However, she lent us bikes, cooked us a great breakfast every morning, and got us a taxi at 4am in our day of departure. The place is on a busy main road but 5 mins cycle from the ruins and the beach. The huts are quaint but expect some bugs! Really nice hostel but as it is Tulum was priced very high compared with comparable hostels. Definitely not a party hostel, the owner chelo was very clear on that! Nice breakfast every morning, drinking water readily available and bikes provided at no additional cost!